Hard water is water that has a high mineral content as a result of coming into contact with magnesium and calcium as it makes it way to your taps. The purification process will do its part to remove a significant amount of contaminants from the water, but the chlorine and other added chemicals will not do anything to reduce the magnesium and calcium content. Hard water can result in a buildup of minerals on your pipes and the appliances in your kitchen. To get the ultimate in protection for your kitchen appliances, invest in the Scalemaster Softline 150 non-electric metered water softener. With this water softener unit, you’ll be able to effectively banish the minerals so that your appliances, dishes, and of course your pipes can stay free from the buildup that would otherwise pose a concern. 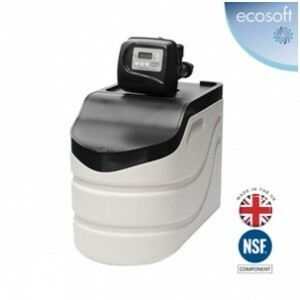 This salt water softener unit is an eco-friendly option for today’s discerning homeowner. 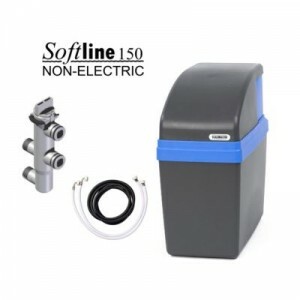 With no motors and no wires, this non-electric water softening unit operates exclusively though the hydraulic pressure of the water that flows through it. This eliminates any potential concerns that may otherwise come about with regards to compliance with an electrical installation. Win the war against hard water, with the new generation of liquid water softeners by your side. Water softeners work to effectively remove the chemicals, minerals, and other residual byproducts that are often found in hard water. So just why is hard water a bad thing? And what are the benefits of liquid water softeners? To truly understand why soft is the better choice for your water, it’s important to learn a bit more about what makes water “hard.” Water is considered to be hard when it has high levels of minerals. The minerals could include dolomite, chalk, limestone, and others with a similar makeup. While hard water is not considered to pose any ill effects on your health, there are some good reasons for you to consider limiting its reach and impact in your home. Water softeners are universally known to have a variety of benefits ranging from luxurious soft skin to a lower heating bill. Salt based water softeners have been the most desired technology for many years, but the Acqua Brevetti MiniDUE ¾″ liquid water softener offers an environmentally friendly alternative. 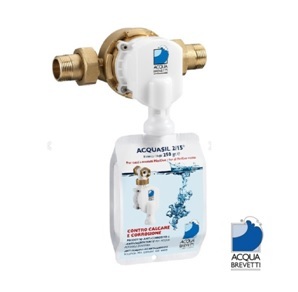 The Acqua Brevetti is designed to be a more practical and environmentally friendly solution to hard water and issues it can cause for your family and your home. This fantastic alternative to a traditional salt based softener, uses no salt, has no waste, and little to no maintenance. But wait, it gets better. The MiniDUE does not require electricity, and is ideal for confined spaces. It truly is a clever and convenient innovation in the water treatment industry. Hard water is common problem for many homeowners in the UK. It can cause unappealing lime-scale deposits on your kitchen sinks and tap. This can cause you to spend precious time cleaning and sometimes harsh chemicals are needed to remove it. A water softener has many benefits for you and your home but the most obvious benefits can be found in the kitchen. Make harsh cleaning products and hours of scrubbing a thing of the past, by installing a water softener in your home. 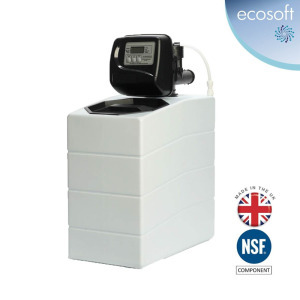 The EcoSoft Premier 10 liter under sink time clock water softener is an ideal option for those seeking to enjoy the benefits of soft water in their homes. This unit will conveniently fit under your kitchen sink, while still leaving valuable space for storage. The softener uses block salt, which basically means it exchanges minerals like, calcium and magnesium that can cause hard lime scale, and in turn provides you with scale-free water. The EcoSoft system simply uses salt to soften your water and does not add any additional minerals or chemicals to it in the process. 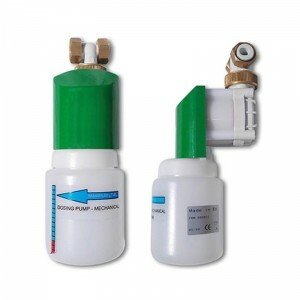 In addition, the efficient design has a built in valve analyses system that manages your pattern of water usage and adjusts to ensure that it is using the proper amount of salt. This system is easy to clean and service and unlike many other products available comes with a double backwash system built in that makes for less-sodium residual. This simple and easy to use water softening system can keep your kitchen sinks, taps, and water using appliances cleaner and lengthen their overall lifespan. Buying guide: salt based or salt free water softeners? You may be in the market for a water softener, because you have heard of the many benefits it can have for you and your home. You have probably come across salt and salt free water softeners and are wondering what the difference is between the two. This is a common question. We are lead to believe that both these technologies work the same, and the only difference is that one does not use salt, but that is not the truth. Here is the skinny, to help you decide which one will best suit your needs. Basically, water softeners work by removing minerals like calcium and magnesium through a process called ion exchange, and replaces them with softer minerals such as sodium or potassium. A salt based softener ensures that the hard minerals are completely removed from your tap before you even turn it on.